I often have to slow myself down with all the cooking and baking, as things also need to be eaten. My husband is my favorite food guinea pig and critic. One of my children is too young to eat considerable amounts of what I cook, and the other is at a stage, where new foods are being refused straightaway. What am I gonna do with all these muffins, I thought, when the batter was enough to make 18 of them? But they went like hot cakes, literally. My son had a few friends over in the last couple of days, and while the kids ignored my baked snacks, the mothers (who came along) dug in!!!! 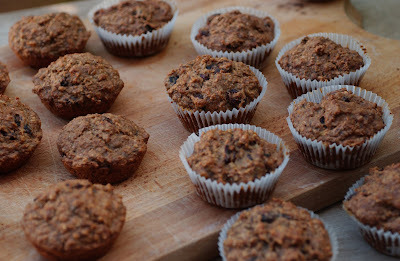 I must admit, these muffins were so delicious and can be enjoyed absolutely guilt-free with all natural ingredients. Very dense and moist inside with some fruity touch coming from the cranberries and the icing on the cake is literally the icing on the cake. I'll do them again very soon, even in amounts of 18 at a time. I know they will be gone before I can blink. Combine all dry ingredients and stir well. Add the oats, cranberries and raisins. Set aside. Combine buttermilk, oil, vanilla. Stir into the flour mixture just until moist. Stir in the the mashed bananas. Add the boiling water and let stand for 10-15 minutes. Line a muffin baking sheet with paper muffin cups or oil with cooking spray. Spoon the batter into the muffin cups. Bake at 190 degrees for about 20 minutes. Remove muffins from the pan immediately and let cool completely. 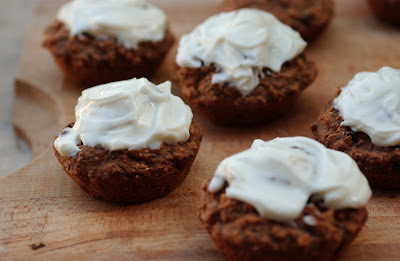 Mix the cream cheese with the agave syrup and put a layer on top of the cooled muffins. Let the frosting become solid before serving.